I hate it when I need these. Don’t you? Procold and panadol? 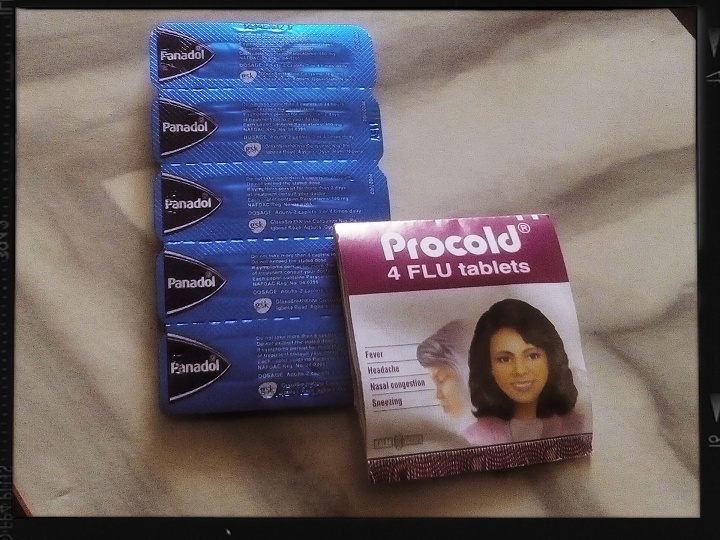 They shouldn’t be taken at the same time, procold contains paracetamol already. I can’t endure drowsy cold medication, there are other alternatives that stop the cold and don’t make you drowsy. It didn’t make me drowsy. And those two were actually prescribed to me. The little witches were having their midnight dance know my head. They might have been beating the drums with hammers. Lucky you at nondrowsy, procold knocks me out. Hope you’re feeling better now. I am. Much better. Just the occasional nasal congestion. I hope you are feeling better. To me, Procold is simply a placebo, only anti-biotics, rest and fluids help my cold. Thank you. I’m almost as good as new. Beaucoup, beaucoup rest my sister o. I am having a lovely week. Hope you are too. I am. I will. Thank you. I feel like you are now purposefully trying to get me sick! Why dost thou hate me?!? You know we have a love-hate relationship, right? Sings* hate that l love you sooooooo……. Very much better, Cush. Hope you are too.